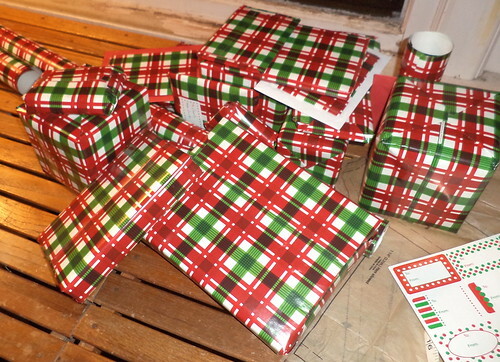 ...I can wrap 90% of my Christmas presents. I shouldn't be surprised, but I am. Getting a full night's sleep without waking up once means there's more energy for things like wrapping gifts when I get home from work. I have one more box of stuff to go. There is a package missing, a flat that came on Tuesday. I need to find that. I remember bringing it in the house but where did I lay it down? I love this wrapping paper. It's from Hallmark and it's one of their giant rolls. Hallmark wrapping paper is printed on the back with a grid for easy straight cutting, but I love this paper because I can use the design to not waste paper. I have a lot of small "wallet-size" gifts this year so I've had some strips left, but most of the time, I am spot on in paper usage thanks to the plaid. If I could find more like this, I'd be all over it. I use a paper until it's gone and then start on another roll. The local grade school used to have a wrapping paper sale in September. The kids, and my daughter was one of them, would go door-to-door with books of paper samples. I always, always bought a couple of rolls, realizing that what the school took in from sales was maybe half of what I was paying. But the paper was good and heavy and they had some really cool designs. I think I got this roll about 3-4 years ago and it was, as I said, the big roll. I don't have a lot of huge gifts to wrap so paper lasts me a long time. I'm waiting on a few more deliveries, but I'm done with my shopping. Yes, I did a lot of it via the Internet. For someone like me with endurance issues, Internet shopping is a godsend. Some things, like the books I'm giving, come from my local independent book store. Some things I've never seen anywhere. I might, if I had a shopping buddy, head into the nooks and crannies of local downtowns to see what I could find. Since I'm on my own, I shop online. I will wrap everything this weekend and package it for shipping. Monday you'll find me on line at the post office. Twenty-five percent more energy means I can last 50% longer.